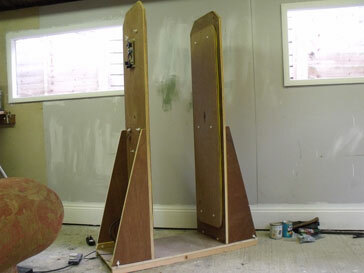 You can build this walk through metal detector for less than £300 ! Probably less than £200. 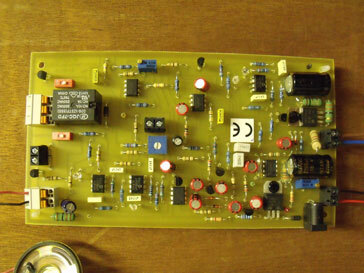 We supply a ready and tested circuit board for £160 including postage to most places in the world. 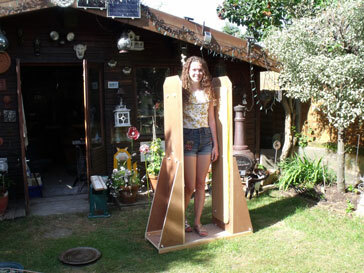 You can build it using simple tools and materials (plywood basically) in a day. Two 2 way plastic screw connectors 3 mm entry. This detector will easily detect items such as knives, guns, stolen tools, stock and equipment. As shown below. It will not detect very small items. The best way to power this board is with a 12v rechargeable battery such as a car battery. This will give very stable performance for several days with very few false alarms . It can also be powered by an indoor 12-18 volt grounded power supply or one of the many low cost switching power supply available for less than £20. Most of these switching supplies have floating dc outputs and performance can be improved by connecting the board GROUND terminal to ground. By connecting a lead and push button/foot pedal to the phantom connection a false trigger can be achieved. This can be useful in some circumstances. You may not always wan' t the detector to be at full sensitivity. Sometimes in areas of very noisy electrical activity you may get too many false alarms, and in these circumstances it will be an advantage to reduce the sensitivity, by turning the onboard control ( T2 )anti clockwise. At other times it will be an advantage to increase the sensitivity. Any changes to the sensitivity will take place after the next alarm. New boards a sent with sensitivity set half way. The sensitivity control can be removed and replaced by 100K linear control and flying leads. On board relay is rated at 10A 250 volt AC. But board should never be connected to mains voltage. Relay output can be disabled if it is not used. Prolonging it's life. Relay can be used to trigger counter or external alarm or other device. The metronome output is useful as an indication that the board is active, But can be disabled if necessary. The metronome gives a continuous two tone alarm until a target is detected. There are no hard a fast rules regarding general construction. I must be wood or other non metallic material. 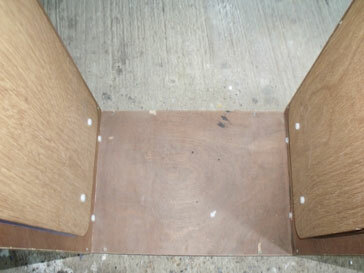 Plywood or MDF are ideal. 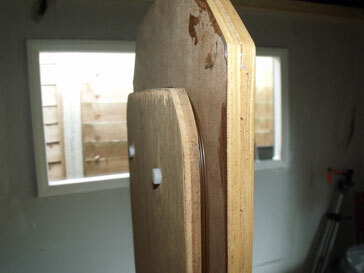 Mdf can be effected by damp, but can be painted. For the detector in the picture above I used 20mm, 12mm and 5mm plywood. as follows. 2 * 150 cm by 38 cm (20 mm) for the main up rights. 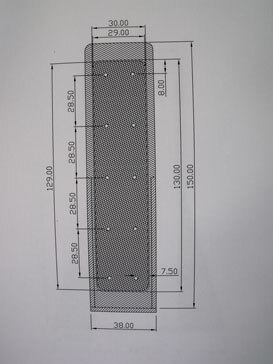 2 * 130 cm by 30 cm (12 mm) for the outer coil former. 2 * 129 cm by 29 cm (5 mm) for the inner coil spacer. 1 * 100 cm by 38 cm for the baseboard. 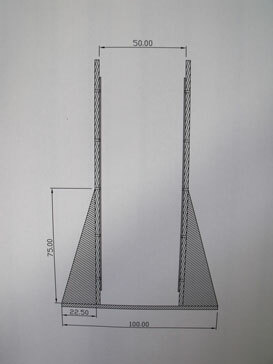 4 * 22.5 cm by 75 cm triangular fillets to hold the up rights . 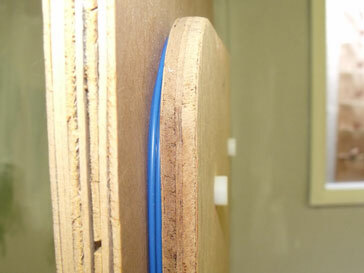 Some 40mm by 20mm softwood to stiffen the base board, and attach the up rights. I used about 30 Nylon bolts and wing nuts 8mm by 50mm to join it all together. The nylon bolts tend to stretch and snap if you over tighten them. I also used wood glue, and screws. The screws are removed when the glue hardens. There are two side by side parallel coils wound from 24/0.2 PVC covered wire. Each coil is off 10 turns and should have a resistance of about 1.2 Ohms, About 2-2.5 Ohms for both coils connected in series. Each coil will take about 30-32 meters of wire if you stick to the dimensions above. If you do not have any measuring equipment Don,t worry. As long as you use the same wire and make 10 turns each coil all should work OK. For the more advanced constructor, there is quite a bit scope for experimenting. As long as the wire is about the same cross section and length, many different configurations can be tried. For example: Taller narrower, Shorter fatter can all be tried. Just be careful not to overload the drive Mosfet. Standing in the arch between the coils look down and and make a mark on the baseboard in front of you. Make a mark with a pencil or piece of tape. Then turn left. The coil surface facing you will be ( left coil inner ) . The other side of the upright will be ( left coil outer ). You can screw the circuit board to this surface. Small screws will not effect the detector. Now turn right 180 degrees. You will now be facing the ( right coil inner ) and the other side of the upright ( right coil outer ). 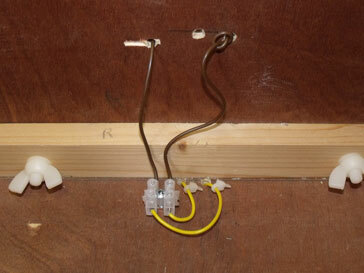 You will have to connect the two coils, by running short lengths of wire under the baseboard. Drill two small holes 50mm apart at the bottom of each coil from inner surface to outer and down through the baseboard. 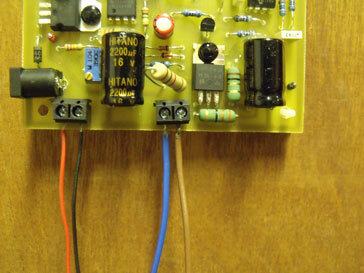 Bear in mind that on the finished detector, all wires must be hidden from view. From the winding point of view, I used 3 different colored wires. Blue,Yellow and Brown. I used colors just to make it easier to illustrate You can use any co lour you like or even all the same. Stand on the baseboard with the front mark in front of you as you look down. Then turn to your left facing the left side inner coil. Push the (Blue) wire through a small hole already drilled and secure from the other side ( Knot) Make sure you push through enough wire to reach the circuit board later. Then wind the left hand coil that you are facing 10 turns clockwise. keeping the wire neat and taught. Push the end of this coil through the second hole and secure (Knot). I you want to be able to dismantle the detector from time to time you will need 2 screw type plastic connectors. About 3mm entry hole. Do not use too big. Before tightening down on the wires it is a good idea to Tin the wires with solder, to enable a good connection. I ran 2 short lengths of wire (Yellow) to go under the base board for connecting the 2 coils together via the connectors. Next standing in the gap, turn 180 degrees clock wise so you are facing the right hand coil. I wound this 10 turns clock wise with the brown wire ( can be any colour ). 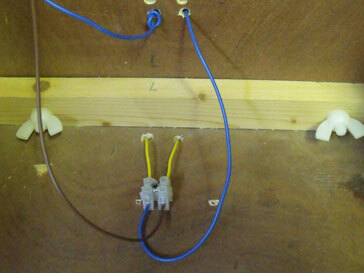 Push the ends of the Brown wire through the right hand upright, and connect to the yellow wire via the plastic screw connectors. Back at the left hand coil. Connect the yellow coming in from the right hand coil to a short length of Brown wire, and connect this to the circuit board. Pictures show. Looking down at the baseboard. Power and coils connections. You should now have 2 coils that are wound clock wise from the point of view standing in the arch. 10 turns each connected in series. The begriming of the left coil and the end of the right coil are connected to the circuit board. Clock wise, Anti clock wise and all that. To be honest I wound these coils all ways possible and it never seemed to make any difference to the performance. Just be carefully not to end up with the coils connected in parallel. This could overload the Mosfet. Above is a picture of the Walker 18 circuit board as it arrives in the post. 95mm by 170mm. For a basic set up you just have to make 6 connections. Power, speaker and coil. There are several different voltages on the board so it is important that you do not lay the board down on to a metal surface, or on to metal items.